I’m a big believer in the importance of taking care of one’s skin. For my skin, I try to use products that are effective, but that are also made with natural ingredients. And, if they’re organic, that’s even better. To add to the picture, I also have eczema. My eczema does worsen with certain chemicals, so that’s another reason I try to stick with more natural products. 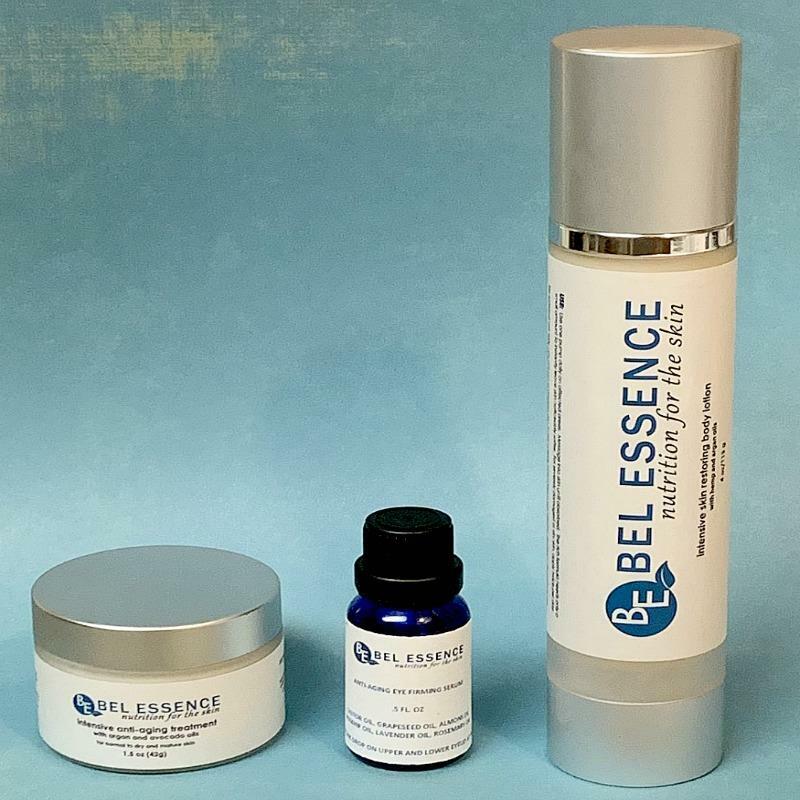 One company, Bel Essence, offers products that provide “nutrition for the skin” (quote taken from their website), which is exactly what I love and need to help take care of my skin. Today I’d like to share a few of their products. I, personally, really like this lotion. It’s not greasy and goes on very nicely. It has a subtle scent—sort of like vanilla. And, my skin feels protected after application of this Skin Restoring Body Lotion. I’m a big fan of argan oil (I have it in my shampoo, and it has made tremendous improvements in my hair). So, I’m really happy to finally have a body lotion with argan oil in it. The Bel Essence Skin Restoring Body Lotion is available in a 4 oz. container for $26 on the Bel Essence website (all prices in this post are subject to change). The next product is Intensive Anti-aging Treatment with argan and avocado oils. This product is for normal to dry and mature skin. According to the product description, this anti-aging treatment contains ingredients (including vitamins, fatty acids, and antioxidants) to help “your skin fight environmental damage and reverse aging for a natural anti-wrinkle treatment that works.” This treatment can help with hydration, repair, and rejuvenation. This treatment is also non-greasy and has a subtle scent like that of vanilla. It blends in easily and seems to do a nice job of moisturizing, which is something I feel my skin needs everyday. The Bel Essence Intensive Anti-aging Treatment is available in a 1.5 oz. container, which retails for $31. Or, you can buy it as a duo with the following serum for $38. The final product I have to share with you is Bel Essence Anti-aging Eye Firming Serum. What I love about this product is that it contains only the following ingredients: castor oil, grapeseed oil, almond oil, rosehip oil, lavender oil, and rosemary oil. That’s it! According to Bel Essence, the various oils in this serum provide a multitude of benefits to help the skin and to provide a more youthful appearance to the skin near the eye. This serum is available as a duo set as described above (which is a great deal in my opinion). Visit Bel Essence and see all that they have to offer. They have several products for addressing anti-aging and other skin care needs. And, to make their products even better, they are certified cruelty-free by the CCIC, leapingbunny.org!